At Marzee Labs we like to build static sites. In this blog post, we're sharing an ingredient list to build a new static site - including a deployment and testing pipeline - in less than an hour. Best of all, all these tools are for free if you code in the open! Typically, static site generators compile a list of markdown and template files into HTML. Funnily, the name "static" is somewhat of an oxymoron. In fact, since we adopted static site generators, we are much more free to adopt and leverage HTML and JS libraries, leading to sites that are much less static than the ones we typically build using a full-fledged CMS. HarpJS: the site generator framework. Our boilerplate MZ Harp comes with goodies like responsive images (leveraging jimp), a basic blog and homepage structure, Gulp integration, etc. Travis CI: for running some tests, and deploying our production site to Github Pages! To make our setup easier, we've written a Yeoman generator that spins up a new HarpJS site for you, and guides you through the setup of Heroku, Travis CI and GitHub Pages. 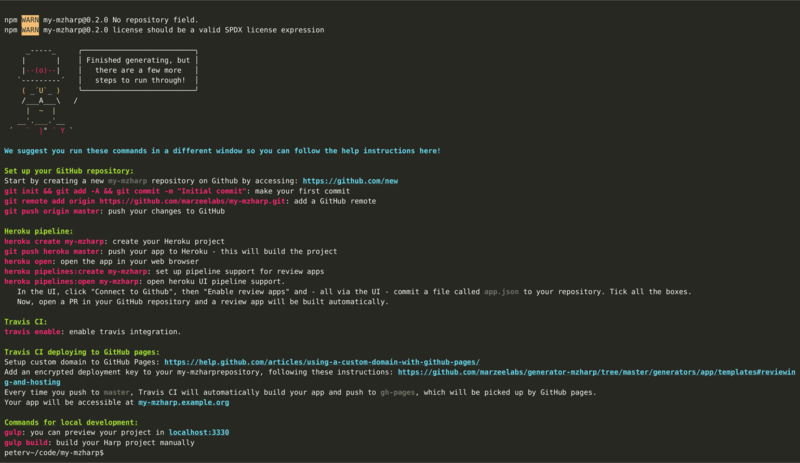 Before we start, set up a GitHub repository and install the Heroku CLI and the Travis CLI. The generator will guide you through the setup of Github, Heroku and Travis, so make sure you have your free accounts set up on these platforms. to see your new site, which should look like http://mzharp.marzeelabs.org/. If you aren't following this yet in your terminal session, have a look at the video below to see how the generator works. One of the nicest feature of this pipeline is to have a new environment freshly built for each Pull Request. To see this in action, edit any file of your newly created Github repository (use GitHub's UI if you're lazy! ), open a PR to your master branch, and watch both Travis and Heroku do their jobs!